The Rock goes out of his way, more so than any other celebrity I can think of, to be nice and accommodating to his fans. He’s always mentioning his fans on Instagram or taking pictures with people who idolize him at the gym, but I think even The Rock would have a hard time answering @bae_unknown_. It seems like this Instagram commenter had more to say but decided to just end his thought mid sentence. This isn’t the most outrageous comment we’ve seen by a long shot, but it is kind of insane. If you’re going to take the time comment on someone’s Instagram, at least have it make a little sense. The Rock is such a genuine guy he’d probably take you out for steak and tequila if you could form a coherent sentence. Until then, keep asking questions without question marks. 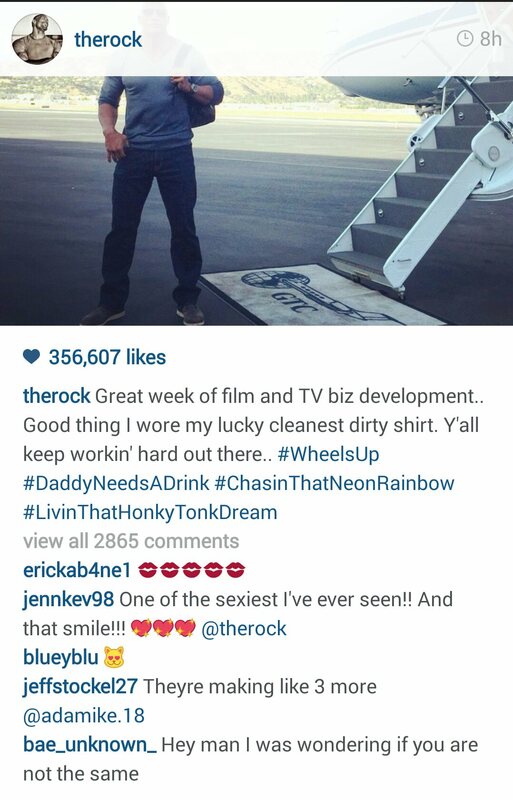 Posted on April 16, 2015, in Average Blog Posts, Insane Instagram Comments and tagged dwayne johnson, fast and furious, instagram comments, the rock, the rock instagram. Bookmark the permalink. Leave a comment.